Pond was dug in April 2018, due to work being done around the new home build it made no sense to seed grass. I seeded grass in October with little germination. Since the house was a new build I used the topsoil from around the pond around the house. And now I have a pond surrounded by nothing but clay an have had a hard time w/ the grass. What type of grass is best for growing in heavy clay? Should I bite the bullet and have a load of topsoil hauled in to use around the pond... not really want I want to spend $ on right now... but on the other hand my water is really dirty and I need to get grass established to clear the water. I really can't speak for your location, but I put down "contractors mix" grass seed. It is mostly fescue and some rye. The rye comes up faster than the fescue and gives you some cover right away, but the fescue is much more heat tolerant and typically takes over. My dam is mostly clay, but did have some pond muck mixed in due to it being a renovation rather than a new build. You will be much better off getting some topsoil on it in the long run, but that will be much more work and timing will be important. IMO, I would wait until after the rainy season to put it down and seed, but then you have to make sure it gets watered. I would hate to see money thrown at soil to have it wash into the pond. Consider raking in some mixed seed now and see how it does with the idea of making it better after spring. To be honest with you, when I have seeded bare soils on my place with the mixed bag of seed...within a year most of the original grass has been overrun with what likes my clay and rocky soil (crabgrass, fescue, and weeds. My efforts seem to contribute to an immediate coverage, but there's no way to establish pretty lawn...without a regular maintenance plan involving fertilizer and aeration, I will never have a yard worth bragging about. Something to think about is the quality of your soil. Clay/sand that was used for your dam is likely devoid of any nutrients and is probably acidic, since it was dug up from deep below what is now the pond. If you invest in some ag lime and spread it on your dam, it will help neutralize the soil so grass can more readily get started. If any runs into the pond, you're only helping the pond. Fertilizer will help also, but then you've got to contend with possible algae issues, but most new ponds typically need a bump to get the phytoplankton blooms to start, so in that respect, it may not be a bad thing. Regardless, you have to make sure the soil is capable of sustaining plant growth. IMO, liming will give you the best bang for your buck before you seed. Then scatter some straw (not hay) over it to retain moisture and reduce erosion. What type of grass is best for growing in heavy clay? By far, the most well adapted grass for clay pan soils is buffalo grass. It forms a dense mat and spreads to fill in. The roots branch and are fine. Mowing and grazing increase its spreading and matting behavior. It does best where other grasses fail. It must have full sun so south facing dam would be a benefit for it. You might consider a blend of seed. The most adaptable will ultimately prevail. I second Mike's rec for liming. I'm nowhere near Ohio, but if there are original prairie type grasses and wildflowers suited for you latitude, it is a gain for nature! Absolutely! I'd always try to grow any plants that are indigenous to the area. There's a reason those plants are so prolific in that region. Lime and fertilizer are going to play a huge roll in establishing almost any grass, then there's the matter of keeping a little moisture for it during the hot summer months, at least the first year, because your clay does not absorb and hold moisture well. After fertilizing and lime I am going to try a good seeding of rye grass for cover and then add some vetch for permanent ground cover, a mixture of hairy and crown vetch, have had really great luck with this in the past here in MO. hate fescue but it does make great cover too. We actually have quite a bit of native prairie and wildflowers here in Ohio and I've made contact w/ a seed provider who sells those seeds. I'm going to try a native prairie and wildflower mix over the dam that the supplies tells me is good for erosion control. I'm still trying to get grass growing better in a few areas, mostly the spillway area. Besides lime and fertilizer, whenever my wife is throwing out old flowers or replanting and such, I take the old potting soil over and spread it around. It seems to help, and I may just go ahead and buy a few bags. I dumped just plain old fescue down, and threw straw down on top of it. Ended up with a strong stand of grass. My clay was rock hard and full of rocks. The areas where I didn’t get the straw down didn’t do nearly as well. I also was fortunate in that we received a fair amount of rain after I seeded. I also threw down wasted wheat seed. It came up and shaded the fescue. Side benefit was it attracted turkeys in the next year. 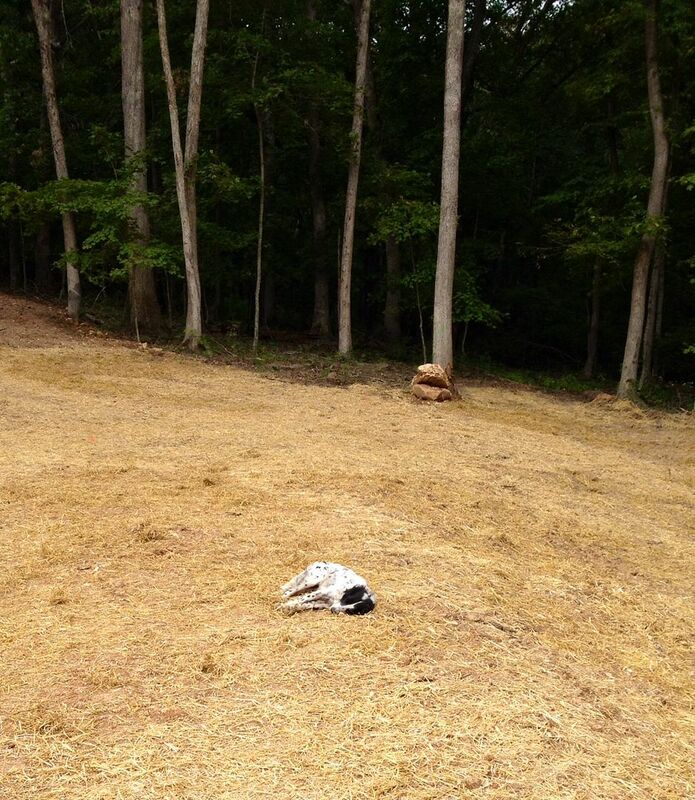 My buddy taking a nap in the new straw.. I put Kentucky Fescue from Rural King down and it does well in my area (Northern Ohio). I've been using Kentucky Tall Fescue as well. On the back of the dam I used rolls of straw matting and it worked great, but I don't think you would want to use it if you already have some growing. Look at "seedsource.com" (Native American Seed company) located in Junction, Texas. The pond was completed April fools day and looks good. Thanks Danny for the info on "seedsource" I found Turner seed and they have a grass mix called "tank dam mix". It comes in 40 lb. bag that should cover 1 acre. I ordered 2 bags so I could put it down heavy and maybe save some for later. I will put it down this week if they still call for rain this weekend. I would assume Turner Seed does not charge big bucks for each pound of seed. As in 80 pounds x $20 per pound!. Good luck! I'll check out Turner. I think I came out well given the 2 1/2 months of near continuous rain starting September last fall. After a failed planting in the fall of 17 (the deer loved the fresh shoots), I planted about $800 of "Native" prairie grasses and wildflowers seed, plus "deer food plot" seed. Not much flowers yet on a steep slope on the north side of a hill. Grass is looking good.